I would like to book a trekking tour, do I need to bring my own equipment? Generally, it is not necessary to bring your own equipment. All you need for camping – tents, mats, stove, dishes – is provided, except for your sleeping bag. But we can also offer rental sleeping bags, please make an inquiry. I will travel to Ladakh and I am concerned about the high altitude. What about, if I can’t acclimate? 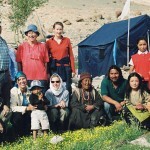 On all our trips to Ladakh, we are very considerate about planning enough time for acclimatization to the high altitude. Meaning: on the first day we recommend that you don’t do anything at all, on the second day we start slowly and plan for a longer rest period at lunch, on the third day we step it up a notch, etc. The start a trekking tour will never be before your fourth day at this high altitude – or even later, depending on the elevation of the starting point. But on every tour in Ladakh it is very important to listen to your body on the first days, to drink much and to sleep with open windows (if you can stand the dogs barking or other noises) and stay calm. And if you should feel unwell, even while following all the tips, we are here for you and bring you to a doctor. He will look at your symptoms and examine you. It is very uncommon that a person following the rules will get altitude sickness and cannot adapt to the high altitude! What happens, when I get sick before commencement of travel or cannot go on the trip for some other reason? What happens, when I get sick during a trekking tour? How do I get to a hospital? Is there a satellite phone on the trip? If somebody gets sick during trekking or cannot continue hiking for some other reason, our team tries to get back to the road as quickly as possible. If the injured person is not mobile anymore but can be transported, it will happen with a pony. If the person is not allowed to be moved/transported, we have to start a helicopter. But this is only possible when the expenses are covered, so to have a corresponding travel insurance is crucial (if you are e member of e.g. “Alpenverein”(mountaineering association), it includes an automatic travel insurance, please get the information from relevant club/association). All relevant insurance data are collected from us prior to commencement of travel. You must not carry a satellite phone in Ladakh, but in every village there is an official satellite phone and we can contact relevant authorities from there. At a lot of places mobile phones work (but not phones from outside of India!). Do you carry oxygen on your trips in Ladakh? We can bring oxygen if you request it, but we don’t bring it along by default. Which vaccinations do I need? Do I need anti-rabies inoculation? Please consult your doctor before your trip. But we recommend vaccinations for hepatitis A+B, tetanus, diphtheria. Depending on the region you will travel in: cholera and typhoid. There are large populations of wild dogs in the whole of India (in Ladakh as well), so anti-rabies inoculation can be advantageous (especially when on a trekking tour away from a larger hospital). How about tips? Am I expected to tip and how much should I give? All around the orient tips are expected by bus drivers, carriers, hotel staff, etc. for their services. Rough estimate: you should calculate € 4 to 6.- / travel day / per travel guest. (So please calculate about 50–70 Euro as tips for a two-week trip.) Of course, tips are very much depending on your satisfaction and the efforts of the team at your service. It is not mandatory! Generally you can say: good service = good tips / bad service = less or no tips! Tips are by no means a replacement for a salary, we pay our staff well. But it is customary in the countries you’re travelling to, to thank the team after the tour you’ve experienced together. If everything went well the customer will give a present (=tip) to the service providers. This is a very important, direct appreciation of the performance of the crew and the team will be stimulated to provide extra special service – so you yourself will profit in the end! Giving the tip is an important ritual. Obviously, it is important – apart from the tips – to thank your team personally, if everything went well. The tips will then be given to all of the team members together (cook, helper, guides, horse minder). Four persons are on a trekking tour for 10 days. Team consists of: 1 guide, 1 cook, 2 helpers, 1 horse minder. 6 EUR/travel day = 6 x 10 = 60 x 4 (participants) = 240 EUR sum of tips = 80 EUR for the guide / 60 EUR for the cook / 33 EUR for each helper / 33 EUR for the horse minder – according to the hierarchy at good service from all team members at the same level. What piece of clothing is appropriate? May I wear short trousers/skirts? A lot has changed already, in many places even young Indian women wear short clothes. But regardless of that – it is often still inappropriate to wear clothes that show legs or shoulders in villages and rural areas. Please be even more considerate while visiting religious places and follow the clothing rules (mostly ancle-long pants/skirts/dresses and shoulders covered). On a trekking tour it is o.k. to wear short trousers, you can try those where you can zip the pant legs on and off in case you need to. Please be careful to look for hidden places when you wash yourself in a river (especially when you’re a woman) – it is inappropriate to take a naked bath right in front of the whole team! Did you not find the answer to your question? Do not hesitate to contact us!